CONNEX is a D.I.Y. (do-it-yourself) educational science kit that provides useful knowledge about simple physics, and is suitable for children of 8 years old and up. "You'll be amazed" to find what you can learn as the activity enables you to learn realistic concept of basic physical theory. All CONNEX kits come iwith an eco-friendly reusable box that is multi-purpose. The box is not only a platform that allows the children to build the experiment, but it is also a storage box to keep all your pieces organized. Carry these kits anywhere you want! CONNEX 14 Electronic Science Set lets you build your own educational science fun! 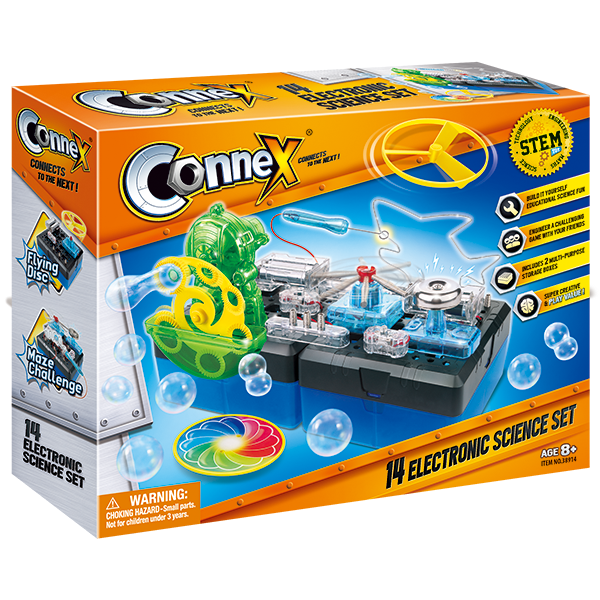 Engineer a challenging game with your friends from 14 different science activities and includes 2 multi-purpose storage boxes. This set includes amazing maze challeng, amazing flying disc, amazing bubble science and amazing color filter. Copyright © 2019 Tradeopia Corp.. All rights reserved.